There are two kinds of films on the track record of Rasoul Sadr Ameli. Since he was originally a journalist, he first made melodramas around moral themes related to family, which were also successful at the box office. Then he turned to making films for children and young adults and made a trilogy about situation of young girls in modern Tehran. An episode of that trilogy, namely, I, Taraneh, Am 15, was greatly hailed by critics and viewers and introduced Taraneh Alidousti, the young talented female actress. 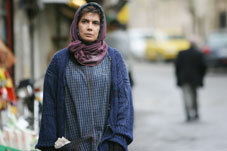 Then he made two films about pilgrimage, both of which were shot in Mashhad. Now, he has made Living with Closed Eyes about differences between parents and children. It is a comeback by director to conditions that he has experienced before. The film is about a young girl and boy who are facing problems with their parents and cannot understand each other. Screenwriter has been written by Mahmoud Arbabi who is a high-ranking official in Ministry of Culture and Islamic Guidance and whose decisions are fateful for the Iranian films. Being a teacher of screenwriting, Arbabi has focused on conflicts among generations. Sadr Ameli, who is also interested in social issues and cultural developments, has rewritten the screenplay before making it. Crewmembers include Faraj Heidari (director of photography), Mohammad Mokhtari (sound recordist), Saeed Malekan (makeup artist), Atousa Qalamfarsaei (production designer) and Mohammad Reza Takhtkeshian (producer). Main actors include Hamed Behdad, Farhad A’eish, Parivash Nazariyeh, Farhad Qaemiyan, Poulad Kimiaei, Atefeh Razavi, Elham Pavehnejad, and Andisheh Fouladvand.